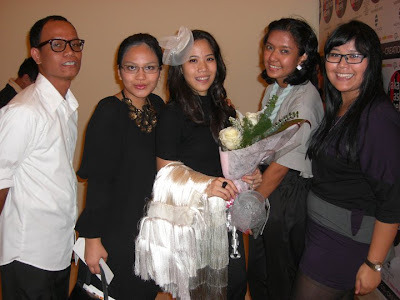 .Jakarta Fashion Week 2010/2011 (Part1). It's been a week since my last post. Really a bad blogger, am I? Anyway this month is the best month for this year. Why?because so many event specially for Jakarta Fashion Week. I've been so busy so today in my free time I can post all about my experience include some photos about that issue. I've got an invitations for one show in Day 4 and one show again in Day 6. Day 4 of Jakarta Fashion Week.. I've got one ticket from my friend that actually joined ESMOD Show and I was so happy to get it. I came earlier because I'm affraid with the crown eventhough I had one ticket on my hand. As my prediction the crowd was big and there was a very long queue. So the show was late about 30 minutes, they have 13 desainers and each desainer was produce 6 outfit. My fave is from Sarah Beatrice who gave me the ticket to this show, I wrote this not because of that cause but when you see her desaign was simple but look sophisticated. When you wore it, it doesn't need much effort just wear the dress and put your fabulous shoes on your feet and a nice earrings, voila you will be an eyecatchy girl. Another cute stuffs is their headbands, so adorable like a pricess who's living on the palace. Another collections by another designer was great too, most of them used traditional material like "tenun ikat" and so on. The closing collection was amazing. Firts they sent 3 male models before the real models bring the real collection. The male models was decorated by indian stuffs like a hat that full of feathers, feathers jacket and sixpack half body. All the mommys who sit on the centre of the stage was screaming when the male models passed them. they said "rraaawwwwrrrr" crazy Momma! I bought my pocket camera, but it's too bad because all the pictures was unfocus so I grabbed all this photos from Demotix and JFW official site. But I think I made a wrong collage since I put some wrong pictures that supposed to be on Day 6 show "The Style Makers" so sorry..
End up the show by meet the fabulous designer named Sarah Beatrice. She kept her amazing dress while people around her trying to give a hug and took a picture together. Congrats Sarah, keep on that spirit and hopefully you will be a great designer in the future, just love it!